When you live in an old house like I do, one thing you realize pretty quickly is that there is never enough storage space for all of your beloved stuff! Sometimes you have to be creative and store things right out in the open- it helps if you have a large enough living space to accommodate such things. I am blessed to say that what my old house lacks in storage space it makes up for in living space- the rooms are super-sized! 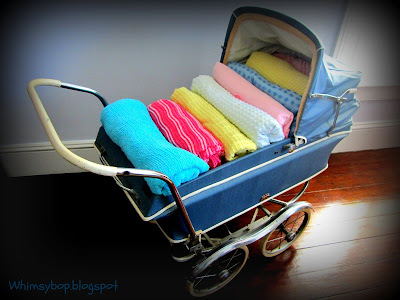 This vintage baby stroller is a perfect example of storing something in plain sight and makes a unique display for my vintage chenille bedspread collection. An added plus, of course, is when what's being stored out in the open is nice to look at- these bedspreads are like eye candy to me because they're so darn cute! It's also a good thing that my bedroom is large enough to handle the chunky size of this big old stroller! I started collecting chenille bedspreads about twelve years ago when my friend Deb gave me this aqua one (on bottom of photo) which belonged to her as a child. I was soon drawn to these pastel colors and puffy textures each time I went treasure hunting. I try to keep my chenille budget to $25 and under, which is a big challenge since they can be quite pricey. Every bed in our house has one on it...or two or three in the winter months (old houses are very drafty too!). You're not gonna believe this, but I found this adorable baby stroller at the landfill! No, I wasn't dumpster diving (that day)- I found it in a little barn that the county set up called the "Too good to waste place." It was a great program where people could put useful items into a barn rather than into a dumpster, making it available to anyone who wanted to take something home and give it new life. I found some really neat stuff in that "too good to waste place" - this stroller being one of my favorite finds! I sure wish other communities would follow suit because it sure beats filling up landfills with treasure! Kudos to the Prince William County Landfill in Manassas, Virginia! I love this post TJ! I've always loved hearing about your antiques and your houses. The stroller is awesome and the bedspreads are beautiful. Great idea TJ! I love the idea of the barn you went to to get the stroller. I agree, more communities should do that.